I went back Stonehenge today and was lucky enough to get one of the ‘visiting academics’ slots (yup, security etc has been so tight that I had to book to go back on the open day to get a look at the exposed trench). The radar seems to have worked quite well, and we got the location of the 1964 excavation right, helping Tim place his new trench accurately. We also found some of the bigger bits of loose rock it seems. I’ll need to go over the data again, reprocess it and compare it to the trench plans to fully understand what we got, but I’m really really pleased so far! 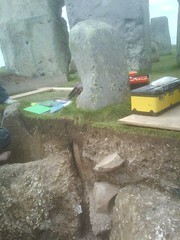 The photo above shows one of the bluestones* (in what is likely to be it’s second setting); much of it lies below ground in a very deep stone socket. Excavation has shown that the sarsens, despite their massive size, have comparatively shallow sockets; the bit uprights you can see behind the bluestone have more shallow sockets than the the one you can see in the image. Geoff Wainwright was explaining that he feels this has to do with the bluestones being to do with an earlier tradition of post-built monuments, like Durrington Walls and Woodhenge, as timbers need very deep sockets. The bluestone sockets seem to echo this, but the practice seems to change by the time of the sarsens. It was an amazing afternoon and I can’t get over how lucky I am! More pictures are up on Flickr, and some of my colleagues from other units and universities have also been on site today, snapping and filming away. Tom Goskar from Wessex Archaeology has photos here, and I’m sure Paul will be adding his at some point. In other news I’m back at my gorgeous site on Dartmoor next week, hoping to get it all done and finished up, and planning a return to Flag Fen as well, in the imminent future, so it seems to be fieldwork-a-go-go for me at the moment. I somehow have to find time to write up my transfer document before the end of June as well, and I have a birthday to celebrate! The fitness thing still seems to be working though I have been being a little slack of late, I am currently 1 lb shy of having lost 2 stone since new year (and hadn’t actually realised that until I worked it out to type it, WOW! Go me!). Me and the not-spouse are about a million and one times happier and fluffier since this time last year, and I’m not thinking too much about any possible correlation. Though I will say I hadn’t realised how unhappy I was with myself until I felt so good about changing things, if that makes any kind of sense! My other resolutions are also going OK, though I’m aware I’m slipping on the ‘being organised’ front. I’m rapidly concluding that I need to plan and block out my time, break things down into teeny goals and make sure I hit them, or I get a bit overwhelmed. So, I’m off to write a plan of action for the rest of the week so I can turn something in to my supervisor to look at while I’m off playing on Dartmoor…. oh, and I have sit ups to do, but Radio 4 to keep me company for those. * hop over to the Timewatch webpages about the dig, which will explain why the bluestones are so important and what Geoff and Tim hope they will tell us about Stonehenge. Oh, I should also add that this little blog got a mention in the Smithsonian magazine… so *waves shyly at new readers*, um, Hi! I guess, hope you like the blog if you found your way here from there! The Smithsonian are helping fund the dig along with Timewatch, and there is some great blogging over there from the production team too!